Children’s Advocacy Centers (CACs) provide children and families with healing and justice in a setting they can trust. We know they do because of nearly 70,000 survey responses we collect each year from caregivers and partners. NCA’s Outcome Measurement System (OMS) helps CACs define their successes in serving children and families while helping them benchmark their progress against the work of a nationwide movement. This rich 2017 dataset from 744 CACs demonstrates the value of the work CACs provide to children and families and the success of the CAC model in the eyes of the partners that make it possible. 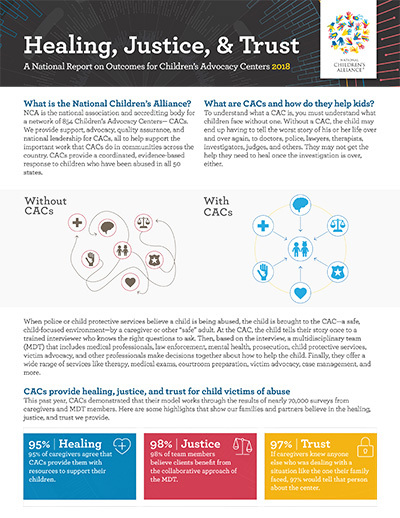 This two-page brief highlights how the CAC model works, its successful outcomes, the momentum of our movement, and the need for continued and expanded support to CACs serving child victims of abuse.